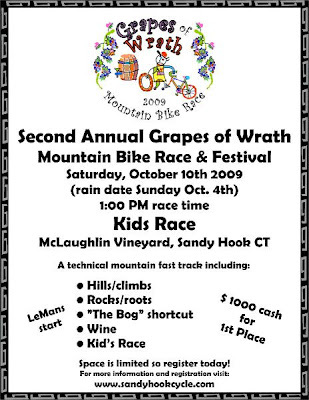 Sandy Hook Cycle and the McLaughlin Vineyards are hosting their second annual Grapes of Wrath Mountain Bike Race at the vineyards on Saturday, October 10th, 2009 at 1 PM, in Newtown, CT. The vineyard trails are open for riding Saturday morning until 12 noon, but remember, this is hunting season so if you decide ride ensure that you are wearing bright colors, preferable blaze orange. Registration fee for the race is $45 and there is a $1000 cash purse. Yeah, didn't look at that too closely.